Next, we create the form and a couple of text boxes for first and last name, username, and e-mail address. First, we create an array that will allow us to store the descriptions for the strength of the password, which is sent from the text box when the button on the keyboard is released. Next, we create a variable that will keep track of the “score” of the password so that we can change the status at the end of this file. 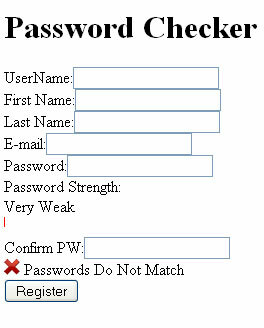 This line checks to see if the password entered is greater than 6 characters long and if it is it will increment the “score” by one. 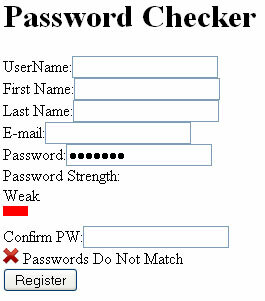 This line checks to make sure the password includes a lower-case letter AND a capital letter within the password and will increment the “score” by one if it does. This line checks to see if the password includes at least one number and it will increment the “score” by one if it does. This line checks for the password to use at least one special character in it and increment the “score” by one if it does. 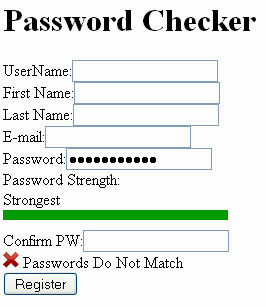 Finally, we check to see if the password is over 10 characters long and if it is, increment the “score” by one. These rules will make a total possible “score” of 5 which if you look above, you will notice coincides with Strongest in the array. This line sets the html that is contained in the DIV called “pwdesc” to the value of the array based on the “score” the password received. (Ex. Desc would show Weak). This file is short and simple. When called, it sets password equal to the value of the box that is calling it, and sets otherpassword equal to the value of the other box. Then it checks to see if they match. If they don’t, they set the image and the text to show that and vice versa. When going to the page you should see something similar to the image above. As soon as I get to 6 charcter (all lower-case letters) you will notice that the bar increases. Add one more letter, a capital letter, a number, and a special character and you will see the bar at it’s fullest capacity. Now we need to make sure we types it correctly. Once you type in the same password in the second box to match what you typed in the first, you should see something like above which has the green arrow and the text to verify that the password are the same. This concludes this tutorial. 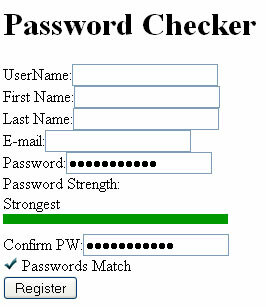 You could make it so that a password has to be a certain strength before the form can be submitted or many more things. Let us know what you do with this tutorial. I hope it was easy to follow and thanks for reading.